As visitors here at Iris Ministries we are allowed to go on an outreach into the African bush. Our group was split in half and five of us headed to the African bush together. 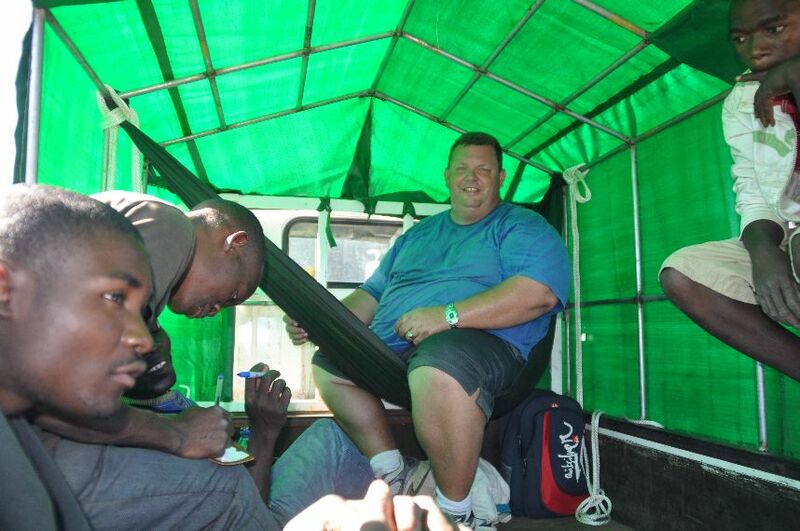 The mode of transport was essentially African: a flat-bed truck. No seats, no cushions, no comfort. “Shocking” is the best description of the transport. Roads in Mozambique are much like Cambodian rural roads, which are just unmaintained dirt and rock roads. At times our small flatbed truck with more than 25 people in it was thrown violently from side to side. A few dozen times I would hit the steel bars so hard I thought I would break a rib. While everyone else was sitting on the bed of the truck with no way to stretch their legs I had a little secret Cambodian ingenuity with me! I brought a hammock and tied it to the bars so that I could sit above everyone else. I had the best seat in the house for sure. I could sense quite a bit of jealously too! After about two hours of banging around we arrived bruised and swollen at the ministry site. (Three days later I still have bruises and sore ribs.) The village we had arrived at was small with only about 20 visible houses. The church has a building with a small blue IRIS sign out front. The building condition was similar to tens of thousands of rural churches around the world. Its front wall, made from mud bricks, had collapsed. Its’ thatch roof was damaged and no longer water-tight. Its’ small dark interior lacked any furniture and was only large enough for 30-40 people to sit. I knew our visit, which included some forty people and two flat-bed trucks, would be a huge encouragement to them. The sun was setting as we pulled in. It was beautiful. However, I knew that we were about to set up our camp in the dark if we didn’t hurry. “Hurry”, I am pretty sure, is not a word which is used in Mozambique where life just moves at its own pace. Though there were electric lines along the road, none of the homes has electricity. After the sun went down we were led back off the main road to a small village hut. Here, we would make camp in the pastors “back yard”. This dirt space would be our home for the next three days. Our only instruction was for guys to set up their tents on the outside surrounding the girl’s tents for protection. 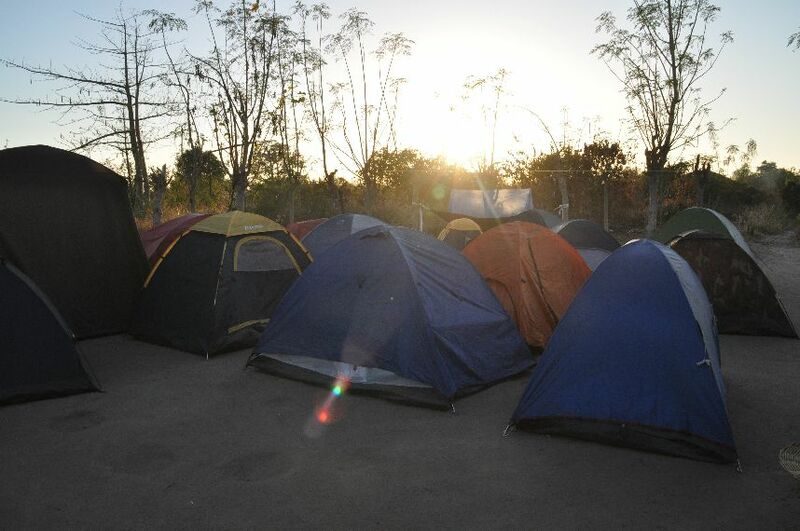 Soon more than a dozen tents were being set up in nearly completely darkness. As I did not have a flashlight (torch to my Aussie friends), I was counting on the full-moon, but the sky was overcast with clouds spoiling my plan. To top it off, I had never seen the tent I was using because I had borrowed one at the last minute. Naturally, the wonderful tent was a “stylish” one making it a bit complex to build. After three attempts, I got it assembled through with advice from my friends. After the build, we had to get ready for ministry. 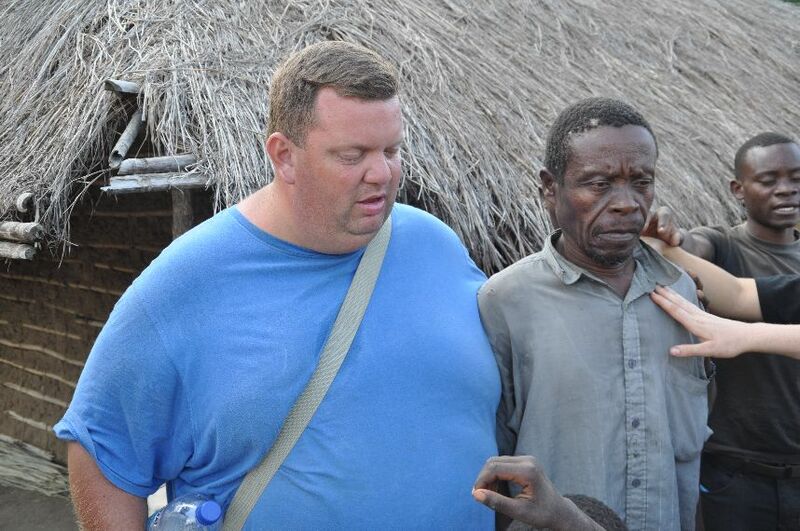 That night we would be showing the Jesus Film, preaching to the village crowd, and praying for sick people. So, after our tents were set up we headed out walking to the center of the closest village. After a fifteen minute walk we arrived in a large opening. 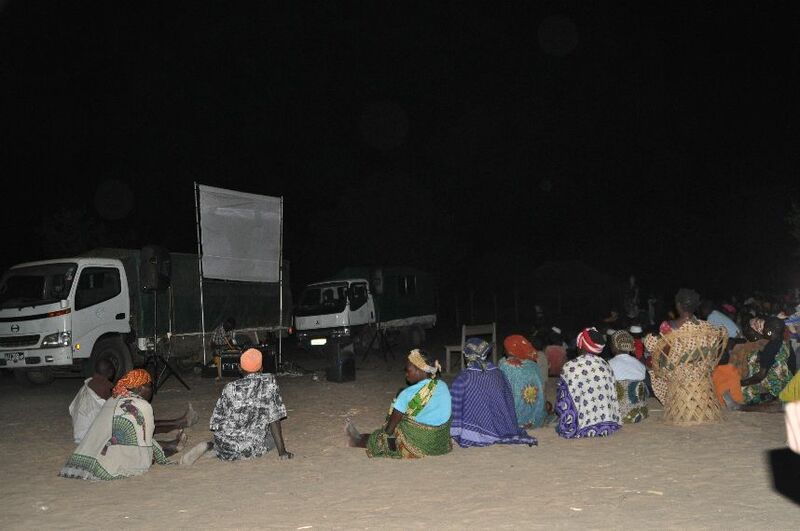 The Mozambique pastors had already set up the screen and projector and an introductory Christian dance song was blaring in order to gather the people. Within short order, the crowd had grown to several hundred people; maybe as many as a thousand. I have no idea where they were coming from because we certainly did not see many houses. I could tell that this was a Muslim village because of the attire of the men with their white caps and women with their veils over the head. On the fly the leaders asked who would be willing to preach and an IRIS student volunteered. They introduced each of our team quickly and then decided it would be time to preach because their experience had shown that immediately when the Jesus Film ended, the people would immediately go home. The un-prepared student got up and delivered a painful 18-20 point message on how “God loves people”. To top it off he was dressed in shorts, a tank top and flip-flops, not exactly giving confidence to the Muslim crowd. As a trained leader and experienced missionary I was grieved to see how this “Gospel” presentation was so randomly thrown together. The saddest part of the “sermon” was nearly half of the crowd walking home as the student preached. The Mozambique pastor did preach a few minutes after that and I hope that he said some significant things to point people to Jesus. Soon after that the Jesus Film was started. I have seen the 1970’s era Jesus Film well over 100 times in ministry, so I knew to find a seat. Its nearly 3 hour length would be an ordeal for my tired body. As soon as it got to the point where Jesus confronted the “Legion” of demons, the head pastor called me and signaled it was time to eat. We then all walked back to our camp and ate a fantastic spaghetti dinner with a blob of mayonnaise right in the middle. I guess the Mozambique leaders thought this was “cheese” for us. Anyway, we all enjoyed the spaghetti, but the mayonnaise not so much! After we ate, I wanted to sleep. It was now nearly 10pm at night and the sun had set at only 5:30pm. After a long bone-jarring day of travel, I was ready to sleep. I made it however, through the conclusion of the Jesus Film and then that pastor asked people to come forward. People literally ran in the opposite direction. Soon, the crowd of a thousand was down to about 100 kids and 50 adults. As I was feeling like we had just wasted a great time to bring people to Jesus, a young man came up to me and started to speak English with me. His name was Georgie. Georgie spoke pretty good English, lived in the village and was one of the few Christians. He took my hand and pulled me to a young girl who I assumed was his wife and small baby. He pointed to the baby’s throat and asked me to pray. I prayed for healing for his baby and God’s blessing on he and his family. He then asked me to come to his house. I told him I would visit him the following day. At nearly 11pm we headed back to our camp to sleep. I climbed into my tent and pulled my hammock over me like a blanket. During the day the temperature was as hot as 95 degrees, but at night it could be as cold as 65 which I was not used to coming from permanently hot Cambodia! 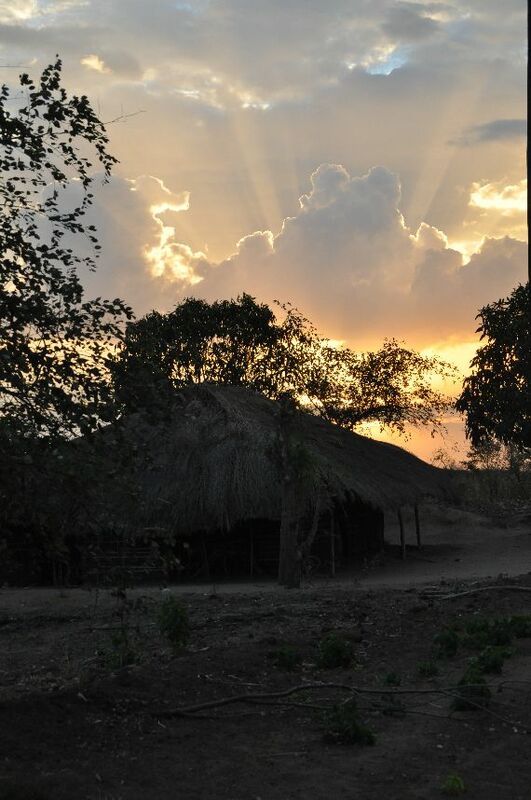 The Mozambique pastors were blaring music and talking up a storm only 6 inches from my head in the next tent, so I put on my headphones and fell asleep listing to some of my favorite worship music. Several times in the night I woke up and just gazed at the stars. They were magnificent. The prominence of the Southern Cross was unique to me since I have lived most of my life in the Northern Hemisphere where you cannot see the same stars. The next day we were up by 5 as the sun woke up our entire camp. Georgie found out where we were sleeping and he was waiting for me as I emerged from my tent. On this new day we walked from morning until night in the village visiting home after home. Georgie led the way. Georgie decided to take me and my small group to the homes of every sick person in the village. . . all of them. It seemed we walked ten miles and prayed for hours. By the end of the day, everyone in that small Muslim village knew us. Many prayed to receive Christ. Many were healed. Several were healed of malaria immediately. We prayed for clubbed feet children and sick mothers. We prayed for a woman who had previously broken her ankle and she said she always walked in pain and with a bad limp. Thirty minutes later she can running across the village to tell us she had been healed! Georgie knew every sick person in the whole village. One man was laying on the dirt and he said he was in pain in his whole body. We prayed for him and he sat emotionless on the ground. The pastor asked, “do you feel better” and he responded, “it usually take a long time before I feel better.” We were discouraged, but ready to pray again. One of our team, David, declared, “My God is the God of the instant!” We chuckled a bit as we prepared to pray again. Then suddenly, the man jumped up like a teenager off the ground and proclaimed, “I am completely healed”, and started dancing by himself! We joined in the celebration. Indeed, our God is the God of the instant! Headaches were gone as well as a woman who had a swollen stomach was healed. It was normal to see miracles take place. We were surprised if we didn’t see an instantaneous miracle. That night again we showed the Jesus Film one more time. During that day, we had talked among ourselves about the need to do better in preparation. That night I spoke as did another visitor from Southern California. This time the crowd didn’t run away. After this day, they knew us and knew what we were about: sharing the love of Jesus. Lost people are ready to respond to Jesus, but someone has to take the Gospel to them. No matter how bad the road and how many miles you have to walk, someone has to go. Jesus shows up regardless of how good or poor our presentation is. The work of healing and salvation is dependent on HIM, not me. Jesus wants to heal people, but we need to go and pray for them. Love opens any door, even in a Muslim village. Americans can travel, live, eat and minister like Africans. We don’t need all our extra “stuff” to make like easier and more efficient. Get close to people. Hug them, touch them, and feel their hearts. Don’t stand at a distance. Let them know you love them. Beautiful story, Steve. Reminds me of so many experiences in the Philippines when we’d hike in to remote locations in Leyte and Samar. I miss those times and the interaction with your mom and dad. Precious memories to be sure. May the Heavenly Father continue to bless you all as you share Christ’s Love literally all around the world. God bless you. God bless you Steve. I thank you for being so ‘real’ in reporting to us who read your posts. I am sure you could write a book about the experiences you are privileged to have. Anyway, you have given me new insights on how to pray with you and others as we assault the Gospel for the sake of the lost. And yet, God never changes, is always ready to save and heal, even when we bungle the effort. The great I AM still functions. Praise Him. He had a reason for you to be there during this event.